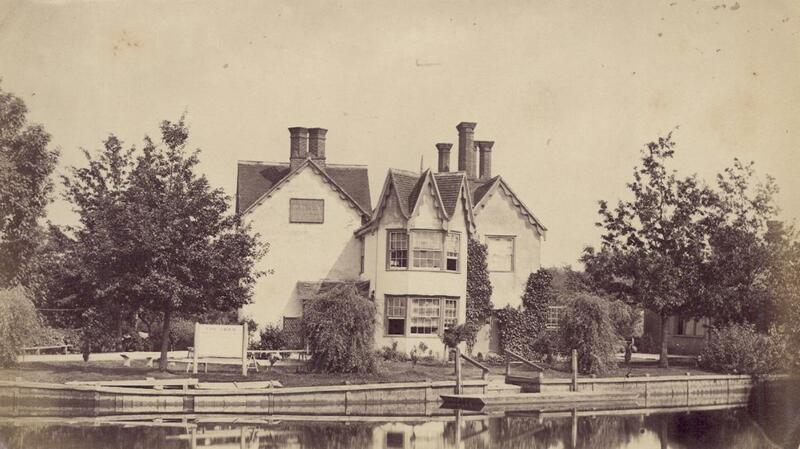 'The Swan Inn at Rose Island' - Sepia photograph of The Swann Inn at Rose Island (once known as St Michaels Island). The inn is now a private house and has been owned for some years by the Hesketh family. The property has extensive fishing rights and a set of stone net weights from this site were donated to the River & Rowing Museum by the current owner. The punt was probably the ferry to bring customers over from the Kennington bank. Photographed by Henry Taunt c1870.